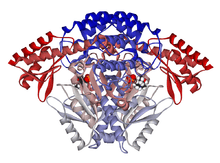 Ribbon diagram of a DOPA decarboxylase dimer. Aromatic L-amino acid decarboxylase (EC 4.1.1.28, synonyms: DOPA decarboxylase, tryptophan decarboxylase, 5-hydroxytryptophan decarboxylase, AAAD, AADC) is a lyase enzyme. The enzyme uses pyridoxal phosphate, the active form of vitamin B6, as a cofactor. In normal dopamine and serotonin (5-HT) neurotransmitter synthesis, AAAD is not the rate-limiting step in either reaction. However, AAAD becomes the rate-limiting step of dopamine synthesis in patients treated with L-DOPA (such as in Parkinson's Disease), and the rate-limiting step of serotonin synthesis in people treated with 5-HTP (such as in mild depression or dysthymia). AAAD is inhibited by Carbidopa outside of the blood brain barrier to inhibit the premature conversion of L-DOPA to Dopamine in the treatment of Parkinson's. In humans, AAAD is also the rate-limiting enzyme in the formation of trace amines. Deficiency of AAAD is associated with various symptoms as severe developmental delay, oculogyric crises and autonomic dysfunction. The molecular and clinical spectrum of AAAC deficiency is heterogeneous. The first case of AADC deficiency was described in twin brothers 1990. Patients can be treated with dopamine agonists, MAO inhibitors, and pyridoxine (vitamin B6). Clinical phenotype and response to treatment is variable and the long-term and functional outcome is unknown. To provide a basis for improving the understanding of the epidemiology, genotype/phenotype correlation and outcome of these diseases their impact on the quality of life of patients, and for evaluating diagnostic and therapeutic strategies a patient registry was established by the noncommercial International Working Group on Neurotransmitter Related Disorders (iNTD). The gene encoding the enzyme is referred to as DDC and located on chromosome 7 in humans. Single nucleotide polymorphisms and other gene variations have been investigated in relation to neuropsychiatric disorders, e.g., a one-base pair deletion at –601 and a four-base pair deletion at 722–725 in exon 1 in relation to bipolar disorder and autism. No direct correlation between gene variation and autism was found. ↑ PDB: 1JS3​; Burkhard P, Dominici P, Borri-Voltattorni C, Jansonius JN, Malashkevich VN (Nov 2001). "Structural insight into Parkinson's disease treatment from drug-inhibited DOPA decarboxylase". Nature Structural Biology. 8 (11): 963–7. doi:10.1038/nsb1101-963. PMID 11685243. ↑ Logan CM, Rice MK (1987). Logan's Medical and Scientific Abbreviations. Philadelphia: J. B. Lippincott Company. p. 3. ISBN 0-397-54589-4. ↑ "AADC". Human Metabolome database. Retrieved 17 February 2015. ↑ Broadley KJ (March 2010). "The vascular effects of trace amines and amphetamines". Pharmacol. Ther. 125 (3): 363–375. doi:10.1016/j.pharmthera.2009.11.005. PMID 19948186. ↑ Lindemann L, Hoener MC (May 2005). "A renaissance in trace amines inspired by a novel GPCR family". Trends Pharmacol. Sci. 26 (5): 274–281. doi:10.1016/j.tips.2005.03.007. PMID 15860375. ↑ Wang X, Li J, Dong G, Yue J (February 2014). "The endogenous substrates of brain CYP2D". Eur. J. Pharmacol. 724: 211–218. doi:10.1016/j.ejphar.2013.12.025. PMID 24374199. The highest level of brain CYP2D activity was found in the substantia nigra (Bromek et al., 2010). 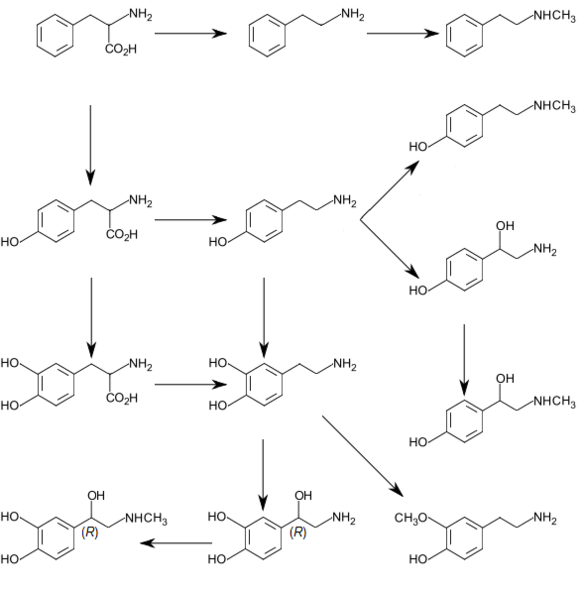 The in vitro and in vivo studies have shown the contribution of the alternative CYP2D-mediated dopamine synthesis to the concentration of this neurotransmitter although the classic biosynthetic route to dopamine from tyrosine is active. CYP2D6 protein level is approximately 40% lower in the frontal cortex, cerebellum, and hippocampus in PD patients, even when controlling for CYP2D6 genotype (Mann et al., 2012). ... Tyramine levels are especially high in the basal ganglia and limbic system, which are thought to be related to individual behavior and emotion (Yu et al., 2003c). Studies have demonstrated that dopamine is formed from p-tyramine as well as m-tyramine via tyramine 3-hydroxylation or 4-hydroxylation by rat CYP2D2, 2D4, and 2D18 as well as human CYP2D6. ... Both rat CYP2D and human CYP2D6 have a higher affinity for m-tyramine compared with p-tyramine for the generation of dopamine. Rat CYP2D isoforms (2D2/2D4/2D18) are less efficient than human CYP2D6 for the generation of dopamine from p-tyramine. The Km values of the CYP2D isoforms are as follows: CYP2D6 (87–121 μm) ≈ CYP2D2 ≈ CYP2D18 > CYP2D4 (256 μm) for m-tyramine and CYP2D4 (433 μm) > CYP2D2 ≈ CYP2D6 > CYP2D18 (688 μm) for p-tyramine (Bromek et al., 2010; Thompson et al., 2000). ↑ Pons R, Ford B, Chiriboga CA, Clayton PT, Hinton V, Hyland K, Sharma R, De Vivo DC (Apr 2004). "Aromatic L-amino acid decarboxylase deficiency: clinical features, treatment, and prognosis". Neurology. 62 (7): 1058–65. doi:10.1212/WNL.62.7.1058. PMID 15079002. ↑ Scherer LJ, McPherson JD, Wasmuth JJ, Marsh JL (Jun 1992). "Human dopa decarboxylase: localization to human chromosome 7p11 and characterization of hepatic cDNAs". Genomics. 13 (2): 469–71. doi:10.1016/0888-7543(92)90275-W. PMID 1612608. ↑ Børglum AD, Bruun TG, Kjeldsen TE, Ewald H, Mors O, Kirov G, Russ C, Freeman B, Collier DA, Kruse TA (Nov 1999). "Two novel variants in the DOPA decarboxylase gene: association with bipolar affective disorder". Molecular Psychiatry. 4 (6): 545–51. doi:10.1038/sj.mp.4000559. PMID 10578236. ↑ Lauritsen MB, Børglum AD, Betancur C, Philippe A, Kruse TA, Leboyer M, Ewald H (May 2002). "Investigation of two variants in the DOPA decarboxylase gene in patients with autism". American Journal of Medical Genetics. 114 (4): 466–70. doi:10.1002/ajmg.10379. PMID 11992572.